San Diego, CA – April 1, 2019 - Eastridge Workforce Solutions was recognized by Forbes Magazine as one of America’s “Best Professional Recruiting Firms”. 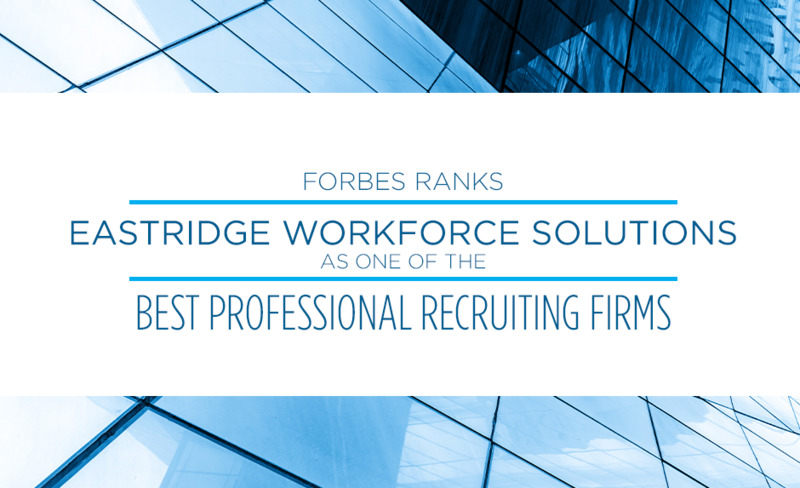 For the second year in a row, Forbes named Eastridge Workforce Solutions as one of the nation’s top professional recruiting firms. Forbes partnered with analytics firm, Statista, to identify the nation’s most successful professional recruiting firms. Statista surveyed 25,000 recruiters and 5,000 job candidates and human resources managers who had worked with recruitment agencies over the last three years. Respondents were asked to nominate up to 10 recruiting firms and firms could not nominate themselves; last year’s findings were considered. More than 17,000 nominations were collected, and firms with the most recommendations ranked highest. Since 1972, Eastridge Workforce Solutions has provided full-service talent acquisition and management solutions for Fortune 500 companies across North America. Ranked as a top professional recruiting firm by Forbes and in the top 1% of firms by Staffing Industry Analysts, we are proud to help over 20,000 associates find jobs across all major industries every single year. With strategic contingent workforce management programs and comprehensive staffing solutions powered by our proprietary technology platform, Eastridge Cloud™, we make it easy for our clients to attract and manage a skilled workforce.